Last Monday’s sudden storms brought uncomfortable reminders of the recent devastation in and around Houston, echoed now in Puerto Rico, and Florida, and other parts of the Caribbean and the Gulf. Those of us who made it to this season’s first installment of the Inprint Margarett Root Brown Reading Series were soggy and a little anxious to come in from the rain. We crowded the orchestra section of Rice University’s Stude Concert Hall, borrowed in the wake of Harvey’s damage to the Wortham Center’s performance spaces. But rather than distract us, both Nicole Krauss and Nathan Englander called attention to the radical resilience of cities, and how storytelling can serve that resilience. Their readings addressed the dedication and distress so many of us have recently witnessed and felt. One of the most exciting things about art is the unexpected synergies and conversations that emerge when various works are placed next to each other, often at random. Whether in the gallery or on a stage, suddenly links are established and connections are made visible. On Monday night at the Wortham Center, the audience witnessed just such an auspicious pairing. As Francisco Goldman and then Nicole Krauss took to the stage, the intimate details from each of their novels created a shared discussion about love, grief, longing, death and hope. Rich Levy began the evening by saying that Goldman’s novel (Say Her Name), though it plumbs the depths of loss, actually emerges as a kind of celebration. Before reading from a surprisingly funny chapter of his novel, Goldman enjoined the audience to giggle whenever they found something humorous; he gave everyone permission to experience a complex range of emotions and not simply a somber melancholy. The chapter featured robotic rats in subway stations and litter twirling the night air like frozen bats, as he recounted several instances prior to the death of his wife Aura Estrada in which he experienced small moments of loss. These were often seemingly trivial stories, typical mix-ups like a forgotten phone call provoking worry or misunderstood directions resulting in both of them standing alone on different subway platforms with a few stops between them. These moments of temporary separation became tiny, absurd rehearsals of the larger absence haunting the narrative. As Goldman joked, “Death doesn’t let you stop for hot chocolate.” There was a sense of fun in the prose, but also a very palpable sense of ruin, of writing from the ruins of the day that was supposed to have been–“the ruins of the future,” as Goldman called them. Both authors mentioned Bruno Schultz’s book The Street of Crocodiles as a text they kept close by during their writing process and a book that Aura Estrada also valued deeply. Nicole Krauss mentioned it as she began her reading as a way of pulling out a thread that united her work with Goldman’s. Unexpectedly, Krauss’s reading also meditated strongly on the aftermath left behind by death. In the section she read from Great House, she used the first-person voice of a father to think about his relationship with his own son after his wife and the son’s mother had passed. In their writing, it seems that both Krauss and Goldman are working towards a similar mystical goal. Why does one begin to write? I said it in a previous post, but I’ll say it here again: I think Nicole Krauss’s most recent novel, Great House, is one of the top three novels I’ve read in the last year. Probably even the last five years. While writing these posts over the past few weeks, I’ve spent some time trying to figure out exactly why I responded to it so strongly. Yes, the sentences are lovely and yes, the story concept is rich, but there was something else I couldn’t quite pin down. Why does one begin to write? Because she feels misunderstood, I guess. Because it never comes out clearly enough when she tries to speak. Because she wants to rephrase the world, to take it in and give it back again differently, so that everything is used and nothing is lost. Because it’s something to do to pass the time until she is old enough to experience the things she writes about. Back when I was applying to MFA programs, I kept returning to that quote when attempting to write personal statements for the applications. Why do you want to be in an MFA program? Why do you want to, of all things, write? I thought I’d never heard anyone say it better than she had—not just that you can’t help but write, but also because it is a way to live the life you can’t yet live, or the one you never will. It is a way to say the good things that happen and control the bad things that happen. It is a defense, and sometimes the only defense. It strikes me now that Great House is really about writing. Yes, there are the four characters narrating their separate stories, but the fifth (and perhaps most important) character is the mysterious writing desk linking those narratives, which has served as witness to both low tragedies and exalted loves across generations and continents. The writing that happens at that desk is the way the characters withstand life’s pain. It is their defense. I think I responded to this novel so strongly because it is, in many ways, a love letter to the act of writing, of recording, of sitting down at a desk—made of veined wood, worn, sturdy, many-drawered—and rephrasing the world. I think I’ve figured it out. This is a fine novel, a great novel. It is a novel for anyone interested in writing, and by that I mean anyone who tells themselves stories in order to survive. In a 2005 New York Magazine interview with Nicole Krauss (click here to read), the interviewer asks to see some of Krauss’s poems, and Krauss declines, “having set aside what she describes as an impossible quest for poetic precision.” Of course, you can still listen to some of her poems here, at the Paris Review. 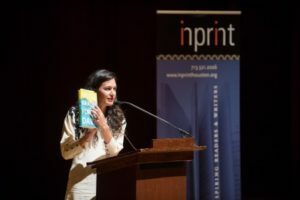 And even these days–after the critically acclaimed Great House was a finalist for the National Book Award –she is often described in reviews and magazines as a “former poet” or someone who has abandoned poetry for the more suitable genre of prose. This might make sense considering that while her most recent novels are gorgeous tragedies, sprawling across time, with textured characters in vibrant settings, something of the poet in search of precision remains in her language. The act of love is always a confession, Camus wrote. But so is the quiet closing of a door. A cry in the night. A fall down the stairs. A cough in the hall. All my life I had been trying to imagine myself into her skin. Imagine myself into her loss. Trying and failing. Only perhaps—how can I say this—perhaps I wanted to fail. Because it kept me going. My love for her was a failure of the imagination. I thought Great House was one of the best books of last year, not only because the construction of it is a brave, multi-voiced beast of a story, but because inside that big structure are precise images and poetic confessions. The whole of Great House is made up of sentences like those above, and while you will be impressed by the structural feat, what will stay with you is the way the lyrical prose glimmered, making you feel as though each confession was only for you. We live, each of us, to preserve our fragment, in a state of perpetual regret and longing for a place we only know existed because we remember a keyhole, a tile, the way the threshold was worn under an open door. In much the same way, what I remember most and appreciate most from Great House are the precise details and images that speak to something larger, but reverberate on the page all on their own. Perhaps Krauss’s inner poet has not been abandoned after all, but rather finally satisfied by the intricate assembly of poetic details into a grandly orchestrated novel. In the summer of 2004 I was 22, poor, recently graduated, and bored at my Washington, D.C desk job. I was frantically checking books out of the Capitol Hill library, hoping something would make my life feel meaningful or tell me where to go next. Nicole Krauss’s Man Walks Into a Room was featured on a display table in the library, and I read it in my too-expensive, too-hot sublet off Constitution Avenue. Man Walks Into a Room is – like much of Krauss’s work – about the nature of memory. Samson Greene, an English professor, develops a brain tumor and suddenly cannot remember anything past his childhood, and then deserts his wife to undergo memory replacement experiments with a Nevada doctor. It is a rich concept with unexpected turns, exceptionally well-written, and I ate it up. But when I got to the end, it became something more. We took a drive and stopped by a path on the side of the road. There was a No Trespassing sign, but we ignored it. The sound of a hunter’s gunshots broke the distance. We ducked into a silo—you could see the sky through the gaps in the tin roof, and there were birds up there. Everything, parts I couldn’t have imagined would care, ached for some physical remark of his love. His mouth was cold and tasted metallic, like the season itself, if that’s possible. To me he always seemed like that, autumnal. Painfully earnest, with an awkward swiftness to the way he moved, a physical remoteness like he was already receding. I don’t remember who kissed whom. It was one of those lucid days in which you can see your whole life like a promise before you. And just like that, at the very end, Man Walks Into a Room becomes a novel also about the nature of love. The two fantastic novels Krauss has written since, 2005’s History of Love and last year’s Great House, also deal with the themes of memory and half-known love, and they bloom out big and fragrant. That the otherwise modest Man Walks into a Room ends where it does, with a mysterious suggestion towards the aching welt at the center of the story, makes sense considering what she would go on to write. I spent two aimless years in D.C, volunteering for losing presidential campaigns and running out of happy hour money, but after returning to that notebook page where I had copied out the epilogue, I decided what I really I wanted to do was write sentences like those, which articulated what it was to want something inexplicable. It’s safe to say that the epilogue was what made me start something new, a writing program. On the early autumn day I drove a UHaul away from D.C, it was beautiful: a clear sky trip through the rolling hills of the Blue Ridge, horse farms and vineyards in the distance, green everywhere, and I was alone. It was the only time I didn’t feel sad while moving. It was one of those days, just like I’d read about.